Take a walk down any skincare aisle in a pharmacy and you’ll see the shelves lined with many anti-aging creams and wrinkle-reducing formulas. While there are many options to prevent wrinkles and slow aging, many opt for more dramatic procedures that include surgery and lasers rather then a simple life style change that includes a healthy diet and exercise. It seems like people will go to any length to continue looking young. But what are the most effective methods to slow aging and fend off wrinkles? Let’s take a look at the top 10 methods to beat aging and look great no matter how old you are. Luckily there are plenty of solutions to the aging epidemic and it eventually affects all of us. 1.) Glutathione - Found naturally in some green vegetables like broccoli, glutathione has myriad benefits for the body. This natural compound helps fight arthritis and can even reduce the risk of cancer. For the purposes of aging, glutathione helps promote healthy and beautiful skin with minimal side effects. This is because the body already recognizes glutathione. The powerful antioxidant can be either injected into the body or can be worn on a patch that delivers glutathione through the skin. pores and can create a slew of pimples and blemishes. 3.) Work it - Hit the gym, go for a walk, do some yoga or pilates and just get active for 30-60 minutes at least three days a week. Not only will your body look great, but sweating will improve the texture and feel of your skin while removing dirt from your face. Wash your face thoroughly after each workout to rid your skin of the dirt that you sweat out. from premature aging. Practicing positive thinking, taking up yoga, and learning to meditate makes such a difference in your stress levels. Taking time out out to de-stress will help you look younger. 5.) 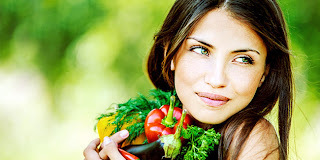 Eat a balanced diet - Healthy and nutritious foods are just what your skin craves and needs. Like stated above, glutathione is found in broccoli. But glutathione is just one of the many benefits that can be found in a healthy, balanced diet. Not sure where to begin? Head to a nutritionist who can help you tailor a healthy diet to suit your lifestyle and preferences. 6.) Don’t soak up too much sun - While sunlight is an effective way to receive the proper amount of vitamin D it can also be damaging to your skin. The harmful UV rays destroy collagen, so be proactive when you’re at the beach, pool, or even just spending time outdoors. Wear a large-brimmed hat that will shade your face, and if you plan to be out in the sun more then half an hour, wear a non-toxic, safe sunscreen. Be sure to apply more if outside for prolonged periods of time. treatments to try and keep everything balanced. 9.) Sleep and nap - The average person needs at least 6.5 hours of sleep every night. Many times, though, it’s hard to get a good night’s sleep with working long hours, getting the children to bed, and dealing the upkeep of the home. Taking a short nap during the day can improve your quality of life, make you feel better, and help keep you looking young. The way you sleep also makes a difference. Sleeping on your side and stomach can create wrinkles because the skin is scrunched against a pillow for extended periods of time. Try sleeping on your back to prevent this. 10.) Smooth wrinkles naturally - One of the most effective ways you can smooth wrinkles and fine lines naturally is by applying organic unrefined shea butter or argan oil to the skin daily. The high amount of essential fatty acids and vitamin E are proven to reduce fine lines and wrinkles and keep new ones at bay. Try Josie Maran Organic Argan oil and L'Occitane Organic Pure Shea butter. Both organic argan oil and shea butter are very effective at improving the look of fine lines and wrinkles as well as improving skin tone, dramatically reducing scarring and giving you that healthy glow from within. So the next time you see a wrinkle start to form, read over these options to get back on track. The more you incorporate your skin care regimen into daily life, the easier it will be to keep your skin looking beautiful and young! Check out the anti-aging infographic with all of these tips to combat aging.